Selecting the right pool company to design and build the swimming pool you’ve always wanted is a big decision and probably the most pivotal one you’ll make in the whole process. Choose the wrong pool company, and you could end up dealing with more than your fair share of wasted time and unforeseen costs. Depending on your situation, there are probably a few places you could start your search, but the most efficient is the Web. Having word-of-mouth referrals is fantastic, but you’ll want to do some amount of vetting for yourself even on those referrals. So, the Web is great not only for starting cold but also for doing research on referrals you already have. Try a search for “Pool Companies Phoenix” or whatever city you live in. Of course, you’ll get pages and pages of search results, but it’s worth your time to look at numerous companies’ websites. 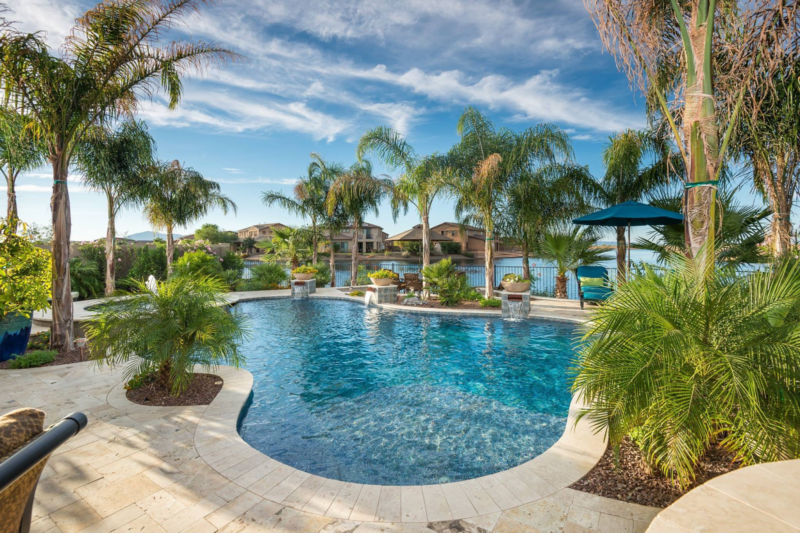 You’ll be able to not only see who is out there but what is out there in terms of the types and styles of pools available. Once you know the type of pool you want, you’ll want to narrow your search to builders who specialize in that process. Next, you’ll want to decide what style of pool you want and look for contractors who can accomplish your vision. Some builders are better than others at pulling off custom designs, so it’s best to look for a company that is clearly comfortable with custom builds and not just the standard traditional styles or package pools. They should also address the whole process from planning, budgeting, and financing to design, excavation, demolition, and construction to successful operation. As your list of candidates gets even narrower, go back to their websites’ portfolios. How much emphasis do they place on custom designs? How extensive and varied is their portfolio? Are they giving you a lot of options, and can they provide examples of having implemented all of those options? In addition to company websites, online reviews can be a helpful tool. Online reviews should be taken with a grain of salt though. While they can offer useful insight, be aware that they are not always from unbiased sources. Some review aggregators even accept payments from businesses to show more good reviews than bad. Check different builders’ standing with the Better Business Bureau (BBB) too. It would be wise to ensure the builders you look at are rated favorably by the BBB and that they have been in business for several years. You want an experienced, established pool company in good professional standing for your project. Once you have narrowed down your list of candidates significantly, you’ll want to start meeting with them and getting estimates. Reputable pool builders will set an appointment with you to either come to your residence or for you to come to their office or design center. Once you’ve discussed with them everything you want to do, they can draw up a detailed estimate for you. Once you have several estimates, you will want to compare them. You might be surprised at how much they vary, so be sure that the estimates you compare are for the same scope of work. You should be wary of extremely low estimates relative to the average. An extremely low estimate could indicate the the builder may not know what he is doing or that he is liable to cut corners. In the end, trust your gut when selecting your builder. You’ve done thorough research, so a combination of that and your best judgment will likely net you a competent and honest pool builder.